You’ll be forgiven for not having heard of Brenda Anvari, by all accounts she’s a bit of a Devonian secret – serving up beauty treatments in her Exter Salon. But as with all secrets, you can’t keep them forever and her beauty range is heading East! I took delivery of her festively-themed Cranberry, Orange & Cinnamon Candle a few weeks ago. Priced at just £12.95, it’s presented beautifully and would make a deceivingly inexpensive present for a loved one this Christmas. Nicely weighted with elegant styling and great appeal. When you put your nose to the unlit wax, you’re greeted with a good hit of sharpness from the Cranberry, flanked by the zesty Orange. It burns cleanly with a good, even melt across the surface. The scent is strong, not overpowering but I do have to extinguish the flame after about 15 minutes. For me, it’s a little too enveloping to be able to sit in it whilst in full burn for longer than that. Ultimately, I guess this is a good thing in terms of value for money but if you’ve a very sensitive nose, this may make it a little too strong for you. 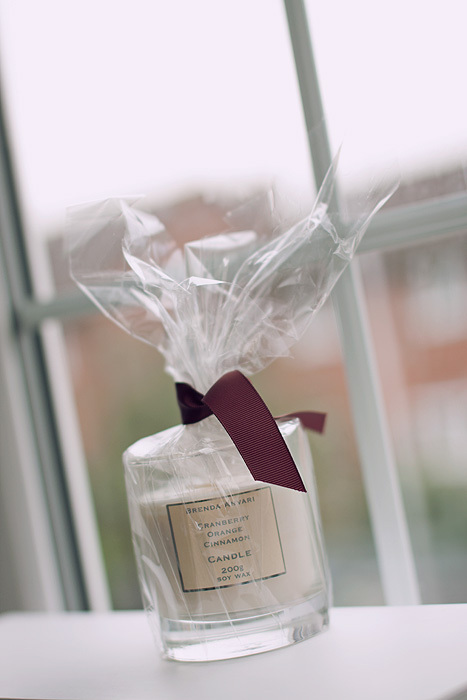 My favourite way to use this candle is to light it when I first get up in the morning and am busy buzzing around, then 20 minutes or so later – the main rooms downstairs are nicely scented and I extinguish the flame before enjoying the scent left behind for a good hour or so after. 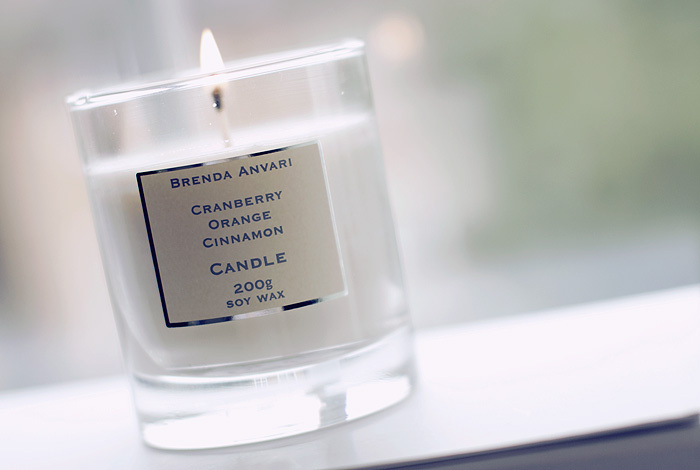 I struggle to pick up much spice or woodiness in this candle, to my nose – it’s more about the fruit which is a bit of a shame and my other sadness is that postage is phenomenally expensive on the Brenda Anvari website simply because everything is courier’ed via CityLink. One of the better courier services but those kind of prices are always off-putting unless you’re making a big order. Thats funny timing as I just recommended Brenda Anvari yesterday! Being a local I’ve heard all about her and her products do look lovely. Thanks for the review…I’ve been thinking of buying this, but kept postponing hoping someone would review it soon. Nice review!! I looked at these recently but am glad you reviewed it before I bought one – I don’t like the candle scent to be too overpowering. I am still burning a Yankee wedding candle someone got for us when we got married – its lovely. I love the sound of this, I wouldn’t buy online with those postal charges but I am close enough to pop by the salon. It’s hard to find a quality candle without paying nearly £30+ – this sounds like a bargain considering the strength of aroma it puts out. I’m sold and will look at the other scents available too, thanks for another great review!